Hello. This is my entry for the design team for Magnolia Down Under Challenge. The theme this challenge was to make Something for Christmas, can be a card or anything else that you want to make. I bought this ProvoCraft wood picture frame on clearance at Michaels. It is 12x12. 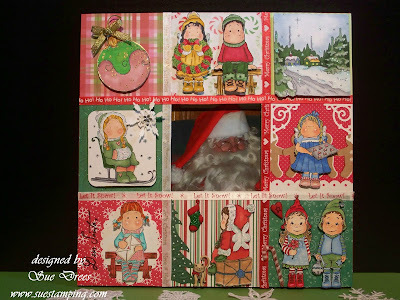 I cut 4x4 pieces of different Christmas cardstock, then decorated each square with Magnolia stamps. The center picture was reserved for Santa. This will be a gift for him on Christmas Eve when he comes to visit. Drop over to the the challenge site to see what the other design team members came up with, there are some really cute cards and projects to inspire you. Then visit their blogs for details. WOW Sue, love what you've done for this week's challenge - this frame is just gorgeous!! All those beautiful Tilda & Edwin images and the alternate squares - fabulous work. Love your colouring and the overall design - perfect for Christmas!! WOW....WOW...Sue the amount of detail you go to each and every challenge is inspiration in itself! You always come up with the most amazing blow me away ideas! I am loving this and think Santa in the middle is PERFECT! An amazing inspiration to all joining in with us this fortnight thank you. AMAZING SUE - you have outdone yourself girl!!! I think I may just have to play Santa and sneak down your chimney to pick this up for myself!! All that work - all those fabulous images - STUNNING!!!! Darn if all these little ones aren't cute! What a great project with so much work! Wow! Awwww, what a wonderful showcase for all of these little images, all coloured wonderfully, as expected, I love the crisscrossed ribbon and the cute buttons. The scene in the upper right is incredibly done!!! Wonderful as always Sue!!! Are you knee-deep in Magnolias tonight dear Sue? Sue, OMG, this Christmas Frame is stunning. You have put some much work into this amazing challenge. Your colours, images and colouring wonderful. I may have to join Debbie & slip down your chimney dressed up as Santa for a chance at this beauty. Such an inspiration for all joining the Challenge at MDUC. Sue, I was flabbergasted when I first saw this. Wow, you've outdone yourself. What incredible attention to details. It's absolutely stunning. Love it. You're such an inspiration to the rest of us. Oh my goodness this is awesome! You put so much detail and so much of your talent into your pieces! wow thank-you so much for sharing it with all of us! WOW!!! What a piece of art!!!! It's got me thinking.